One of our club activities last winter was a mini-workshop on trunk fusion. For any who don't know, this technique involves binding together some young and thin whips - however many you like - and forcing them to grow together to form a single thicker trunk. It's used primarily with vigorous, fast-growing species like trident maple (Acer buergeranum,) schefflera, and many species of Ficus. For our mini-workshop, I used four rooted cuttings of Ficus microcarpa 'Tigerbark ,' of various thicknesses; the thickest was about the girth of a standard pencil. Some people use plastic wrap to bind the component trees together; I prefer zip ties. One bonsai master I know uses both, with the ties over the plastic. Whatever you use, the important properties of a binding material are, first, that it allow the bark to breathe; and, second, that it not stretch: the idea is to force the trunks together so they fuse. 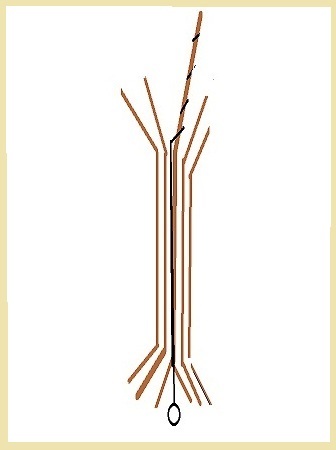 The brown represents the trunks, the black the wire. This is an experiment. The idea is that an anchor wire can be threaded thru the loop from below, and hold the tree in the pot without showing on the soil surface. It remains to be seen whether such a setup will adequately keep the tree from wobbling in the pot once its roots are re-established. The upper length of the wire, starting from where it emerged from the bundle of trunks, was used to give some shape to the upper part of the primary trunk. I meant for the wire to be in the center of the bundle, but the shapes of the trunks were such that it was forced to one side and partly exposed. However, given the vigor with which F. microcarpa grows, I expect the wire to be hidden within a couple of years. And this tree has lived up to its variety's reputation: I had to replace the ties twice during the summer, when they began to bite too deeply into the bark! I replaced them a third time tonite, and decided to take some pictures. Before work began. You can see how much the primary trunk has outstripped the other three. I picked up the green ties at a garden center outside Suí an Róin, Co. Offaly. the wire showing here and there along the left side of the partly-fused trunk. Usually I try to have a new tie in place before I cut the ones above and below it. Ties are pulled snug. The wire was cut off the upper part of the main trunk earlier this year. Tonite I removed most of the wire visible in this picture. A new set of zip ties is in place. The blue arrows indicate the length of wire that was removed tonite. The rest will remain permanently embedded in the tree. of the trunk: a drop of water may have gotten on the lens. But of my "after" pictures, this gives the best view of the work. As you've seen, the ties have left rings of obvious constriction on the trunk. But given the speed with which this fig grows, I expect those to grow out and disappear within a few years. By the beginning of next summer I expect the trunks to have fused together enough that ties will no longer be needed. My provisional long-term plan for this tree is a modified broom with a broad, spreading canopy, probably with aerial roots dropping to the soil. Sooner of later, I want to try this technique with another fast-growing species, this one temperate: bald cypress. I'll be sure to take pictures when I do. A gentleman named Michael Himes is the CEO of one of the largest wholesale dealers of gasoline and diesel fuel in the USA. He is also a bonsai enthusiast, with enough disposable income to invest in high-quality trees and to build a second-floor "bonsai deck" at his company's headquarters. Last August 8th, he invited any interested members of the Fort Wayne Bonsai Club to enjoy a visit to his collection. Let me take you on a photo tour. There is a door at either end of the deck; this is the view as you step thru the south door. The whole bonsai garden is tastefully designed. with the Fort Wayne skyline behind them. A closer look at the bald cypress, designed in the "flat-top" style developed in the southern US. I think it's a collected tree. Can't you imagine it standing tall in the Okefenokee swamp? This podocarpus (Podocarpus spp.) has an excellent base. and Guy Guidry's replica of John Naka's famous composition "Goshin." The design of the RMJ is still being developed. It could be stunning in a decade or two! A ponderosa pine (Pinus ponderosa) collected in Colorado. Back under the pergola and looking toward the north door, which is hidden by "Bigfoot." before it will fit thru the door to summer on the deck. 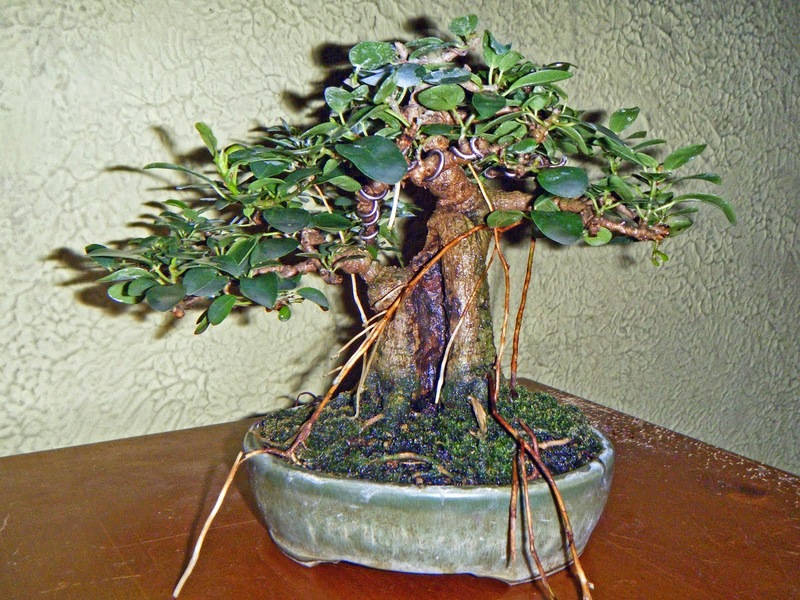 "Littlefoot," another F. microcarpa, was Michael Himes' first bonsai. Both "-foot" Ficus were purchased from Miami Tropicals. Not all Himes' trees are necessarily spectacular. This very decent mid-sized schefflera sits across from "Bigfoot." From the north door, with "Bigfoot's" foliage visible to the left. Michael Himes is an enthusiast who collects bonsai and enjoys them, but leaves their care and styling to others more knowledgeable in those areas. From time to time he hires a recognized master (Guy Guidry being the latest) to work on his trees. And for their everyday care, Darlene Kittle, the Fort Wayne Bonsai Club's current president, serves as paid curator of the collection. Two of Michael Himes' bonsai are not on the deck, but sited beside an outdoor pond-and-rock feature. Darlene took us around to see them as well. Darlene beside Himes' second Podocarpus, with a bald cypress behind her and to her left. The top of this tree died after it was wired, and the tree will have to be re-styled. but with the rocks and pond that proved impossible. You can still get an idea of the tree's design. I hope you enjoyed the little "tour." And with this post, I have caught up when it comes to sharing recent bonsai events. Now, forward on the blogging.